Because the Kroma Audio Carmens were also over for review simultaneously I wondered how the humble Scorpio would perform with these spectacular speakers. 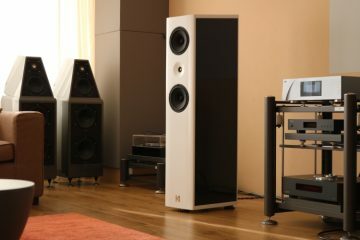 Priced at 55k it doesn’t really make sense to drive them with a 3900 euro amp but, hey, I’ve tried weirder combinations. Because the speakers were reviewed using upscale amplification from CH Precision, Zanden and Audio Research, I first went back to basic with the PrimaLuna DiaLogue Premium power amp, driven from the CH Precision C1 DAC in controller mode, meaning that its volume control is enabled, using AudioQuest Water cinch interlinks. The PrimaLuna is an amp that consistently impressed me with its value for money. In spite of its modest power output, the little amp has had no issues at all driving all the speakers that I tried it with and the efficient Carmens are no exception. 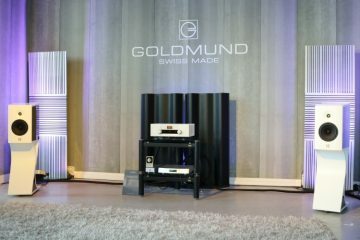 With this amp, they sound bold and powerful, with strong dynamics and a natural, convincing timbre. Sonority and power remain this amp’s strongest assets and it drives the relatively efficient Carmens with authority indeed but compared to the aforementioned esoteric amps, the PrimaLuna lags behind in aspects such as resolution, refinement, air, and soundstage layering. It is mostly just a bit too rough, painting with broad strokes. But that’s only fair given its modest price, or so I’ve always thought. 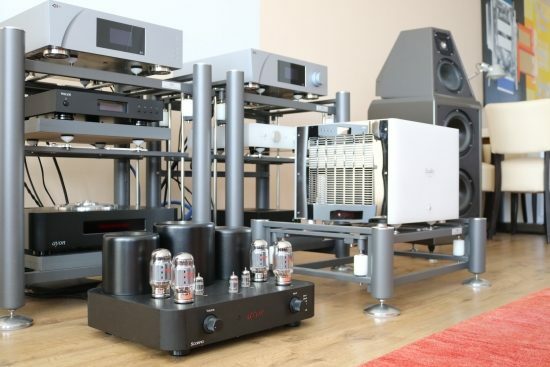 Now there is the Ayon Scorpio, priced a little bit higher but still in the same price category as the PrimaLuna but with a remote-controlled tube preamp and with KT88’s instead of EL34’s. Built entirely in the EU, it does not benefit from low Chinese production costs so one has to wonder: can it offer the same value for money as the PrimaLuna? As it turns out, some of the entry level Ayon models are sub-assembled in neighbor countries by Ayon-trained engineers with final assembly and testing done in the main factory in Austria, meaning that the Scorpio can be built at a very competitive price point. Still not knowing what to expect I switched the C1 to DAC mode (fixed volume level) and connected it to the Scorpio using the same interlinks and… I was amazed! This amp sounds just as solid, sonorous, upbeat and dynamic as the PrimaLuna but much more transparent and much more refined. Also, it is faster and more articulate and has a natural, lifelike timbre to die for. It sounded so good that this evening went into CP history as one of those legendary ones where the emotional involvement was at 100% and we played track after track while the hours ticked away. 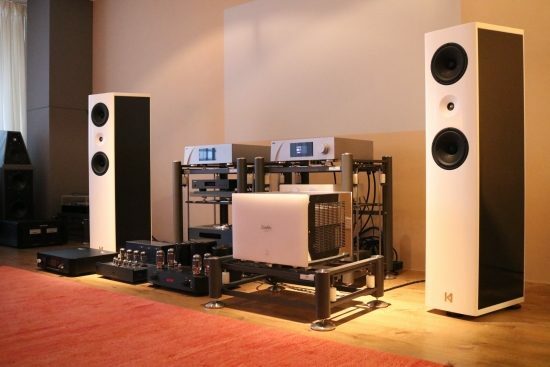 Everyone who visited was impressed with the sound and visitors who did not know the amp structurally estimated it to be much more expensive than it is. The Scorpio was also used with the Wilson Watt/Puppy 8 and while the Wilsons don’t perform on the same level as the Kroma’s, the Scorpio drove them equally splendidly. 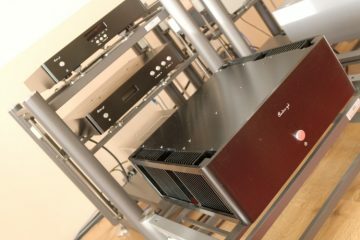 The Ayon’s presentation (using it with 4-ohm configuration) is actually much closer to that of the Audio Research Ref75 SE’s than that of the PrimaLuna. 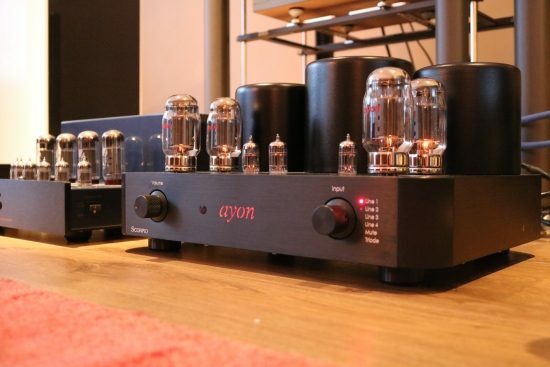 When comparing the Ayon with the Audio Research, I used the latter with its 8-ohm outputs because it lacks power and control with its 4-ohm outputs when combined with the nominally 8-ohm Carmens. Although the Audio Research is more airy, fluid and refined, though, it lags behind the Ayon in terms of bass control and overall dynamics and slam, which, for me is very important. 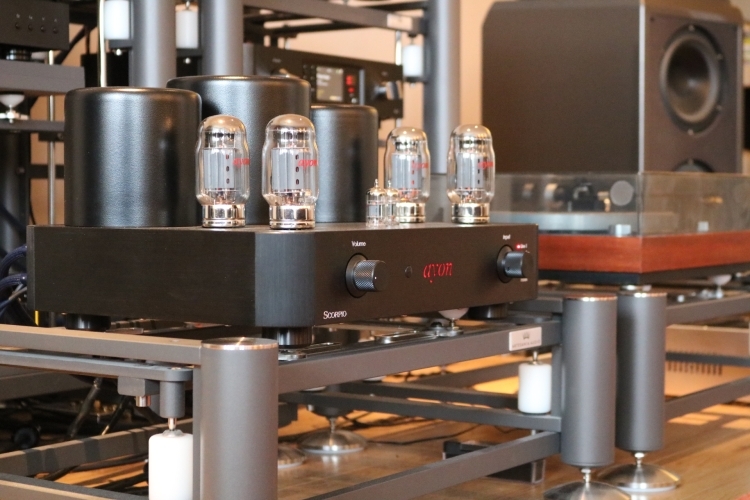 In addition, the Ayon has an even purer and direct-coupled (as opposed to more refined but also more filtered) midrange but still somehow a certain richness, without actually sounding particularly warm. This may be an intrinsic KT88 effect but I’d have to do more experiments to know for sure. That the Scorpio would perform so incredibly well even with incorrectly matched impedances, speaks volumes of its power supply and output transformers. 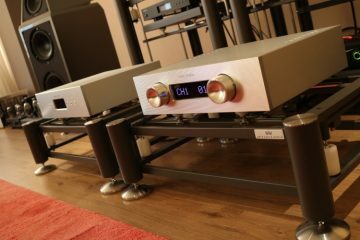 The amp performs perfectly right on the floor but when placed on top of the Artesania Aire platform (like the Zanden) it gains some more refinement and air. The Zanden 8120 is in a category of its own, with a unique combination of attributes that I have not heard before with any other tube amp. Among others, it combines smoothness and rich textures with superb transparency and refinement, topped off with enormous dynamic power in a way that is unique for tube amplifiers. 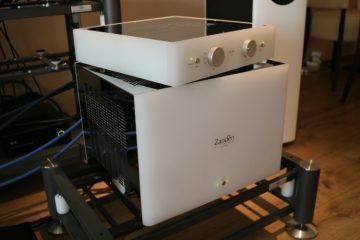 Still, I can’t say that the Zanden beats the Ayon on all accounts, at least, not with efficient speakers such as the Kroma Audios or the Wilsons. It’s a matter of quality as well as of taste and some people may well find the Ayon a little bit too direct and may prefer a warmer, gentler or smoother presentation. For me, however, and with these speakers, the Scorpio turns in a very lifelike performance that I find even more captivating due to its purity, directness and sheer communicative powers. There was a long period during which I had more Apogees in my room than I could count. I lovingly called it the “Apogee Forest“. 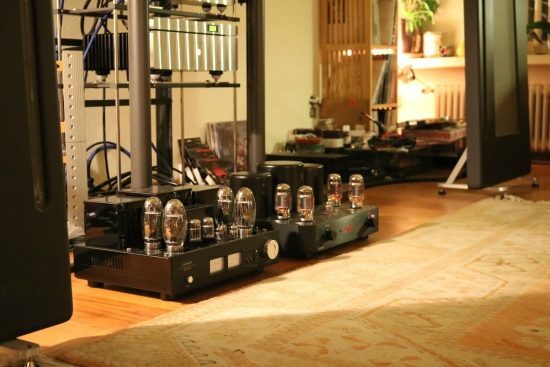 My Duettas are long gone and when I sold the Divas all that was left was a single pair of refurbished Duetta Signatures which were on a super-extended visit, courtesy of audio buddy JW, who took a couple of years to decide what to do with them. Now that these are also sold, I’m all out of Apogees. 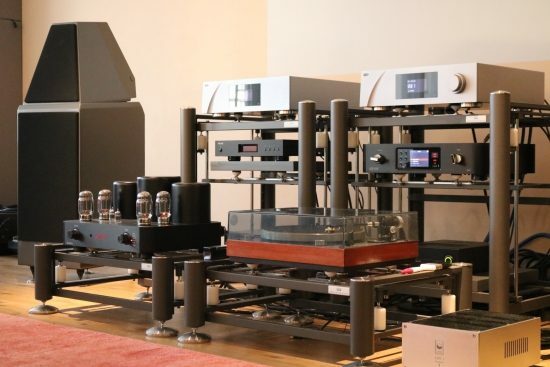 However, JW still uses original Duettas, first with a Jeff Rowland Synergy IIi preamp +BPS and model six power amps, later with the same preamp and an Audio Research Ref75 SE and recently with a Line Magnetic LM-150IA, an integrated amp, bypassing the Rowland preamp. The LM-150IA had so hugely impressed JW that he decided to buy it right after hearing it once. Only months later he heard the Scorpio with the Carmens at my place and was also hugely impressed. And so, we took it to his place for a final comparison. 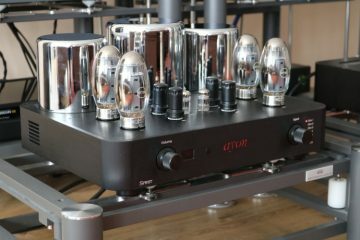 Now, the LM-150IA uses KT150 tubes and offers 100 watts, as opposed to the Ayon’s KT88’s with 45 watts. Also, the LM-150IA costs 5000 euro, versus the Ayon’s 3895 euro. Could it keep up? 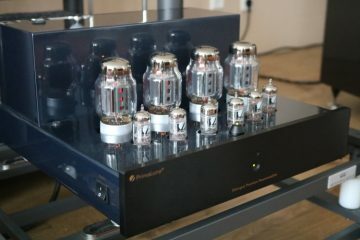 The Apogees need a fair amount of power but as long as one does not expect rock concert levels, many tube amps have proved to cope just fine. The Scorpio, however, was definitely more than fine. 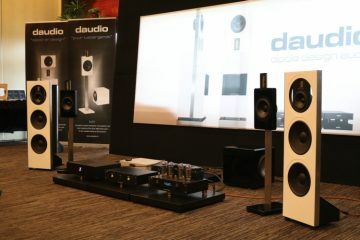 While it did not have all of the bass slam and dynamic power of the LM150IA, it sounded utterly upbeat and articulate. It was the opposite of the typical sound of a tube amp running out of steam: no softening of transients here! More importantly, it had a purer, clearer and more lifelike midrange that again reminded me of the more direct-coupled SET purity. The LM-150IA has a smoother presentation with a more room-filling soundstage that was highly entertaining but after having heard the Ayon’s more intimate and more direct presentation, we couldn’t help but feel that we were missing the Scorpio’s purity and lifelike presentation, even if it was less powerful and we wondered how the KT150-equipped Ayon Spirit III would perform in this setup but that will be for a next review. 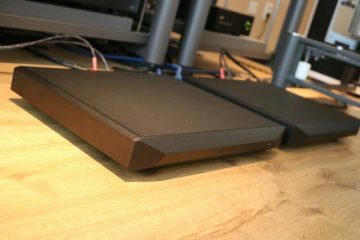 Although the Apogees clearly fared very well with the extra juicy that the LM-150IA provided, we really were hard pressed to choose a favorite, both performing at the same overall level and with their respective completely valid merits, despite the price difference. What’s abundantly clear is that the Scorpio performs way beyond its price tag. The Scorpio has a subtle warmth but none of the mid-bass bloom that plagues so many tube designs. It’s absolutely never reluctant to flex its muscles and it sounds incredibly dynamic and lifelike, with rich midrange textures and a front-to-back 3D bubble with an organic fluidity that is near impossible for any transistor amp to achieve. In some aspects, the Scorpio’s sound even reminds me of the Crossfire III, which is no small achievement! Let’s not beat around the bush: for me, the Scorpio is the new reference in its price class, and considerably beyond.